MIAMI (CBSMiami) — Florida’s Department of Health is warning spring breakers about a toxic chemical inside ink used for temporary tattoos called henna tattoos. The paste in black henna tattoos contains a toxic chemical found in black hair dye called para-phenylenediamine (PPD). “When applied directly to the skin, the PPD found in black henna tattoos can produce serious adverse health effects in children and adults,” said Deputy Secretary for Health and Deputy State Health Officer for Children’s Medical Services Dr. Celeste Philip. The department said those who do get henna tatoos should find out about its ingredients. “Always ask to see the ingredients of the paste before having a henna tattoo applied to your skin or your child’s skin,” said Philip. 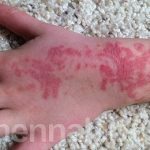 For those who react badly to the PPD in a black henna tattoo, symptoms usually include itching, burning, blistering, oozing, scab formation and, in some cases, permanent scarring in the shape of the tattoo design. Depending on how much PPD is in the paste, symptoms may occur within a few hours or few weeks after getting the black henna tattoo. While the black ink henna tattoos contain PPD, the brown henna tattoos do not have adverse effects and are made of natural henna leaves among other things.